The Green Grid has released White Paper #46 as an update to their "free cooling" maps for data center design and operation. The research was edited by Emerson Network Power, Intel, and Schneider Electric. 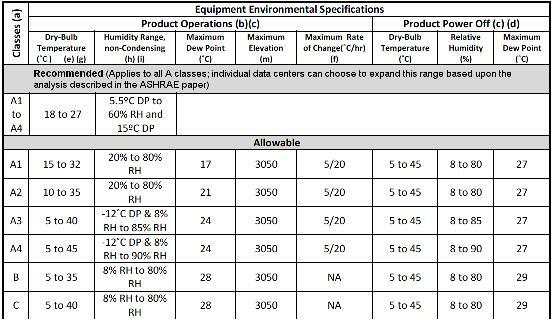 The reason for this update to the "free cooling" maps was the latest changes to the ASHRAE TC 9.9 operating/design guidelines for data centers. For those who have not yet seen those new guidelines they allow a much larger operating range for data centers and server rooms that use some of the latest equipment from companies like Dell and HP. 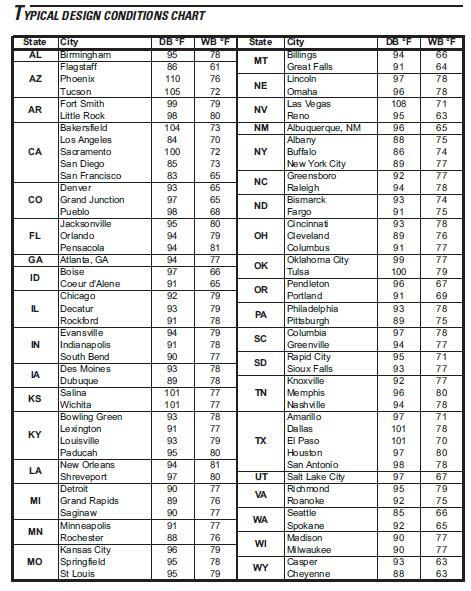 For those of us who are "metric challenged" 40 degrees C = 104 degrees F and 35 degrees C = 95 degrees F.
When you consider that many data center operators still seem to want their rooms at 70 degrees or lower it is clear that these new criteria are a massive change in operation and design concepts. It is also clear that adopting the newest guidelines can result in enormous energy savings. The Green Grid paper includes a couple of maps to quickly illustrate how extensive the potential for "free cooling" has become under the latest operating/design guidelines. 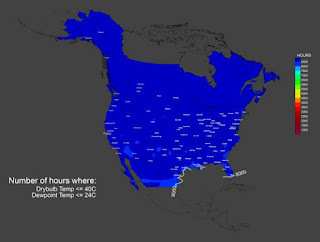 In these maps the darker the blue color the more hours that "free cooling" could be employed. The darkest color blue indicates that all 8760 hours are suitable for "free cooling". The maps also consider the coincident dewpoint temperatures as that metric is important also. This first map is for ASHRAE Class A3 environments and shows that virtually all of North America could have their data centers cooled without using chillers or compressors. 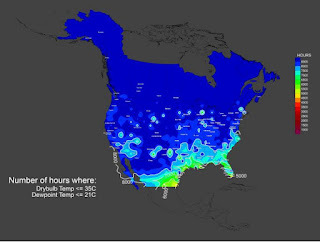 The second map is for ASHRAE Class A2 environments and shows that roughly 80% of North America could still be cooled most of the year with no chillers or compressors. The question for data center operators and designers who want to implement these new temperatures is what to do about those 500 or 1,000 hours when the outside air conditions are not quite right. It is still quite possible to operate the center with no compressors or chillers if the designer will incorporate an evaporative cooling system such as the Aztec indirect evaporative cooling system or even the Alton direct evaporative cooling system. Since evaporative cooling systems operate using 100% outside air all the time they make an excellent "hybrid" approach. During the many hours of the year when "free cooling" will satisfy the conditions either type of evaporative cooling system will provide cool, filtered, outside air. The Aztec indirect evaporative cooling system has the added advantage of allowing recirculation of hot aisle air during the very coldest months when "free cooling" could actually over-cool the data center. 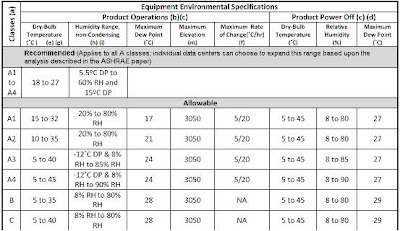 During those few hours of the year, however, when it is simply too warm for "free cooling" to work, the Aztec or Alton systems can automatically initiate their evaporative cooling cycles and trim the outside air temperatures down to levels that fall well within the new ASHRAE guidelines...again, with no compressor or chiller energy required. The air leaving the evaporative cooling system will usually be about 3 degrees F higher than the wet bulb temperature. 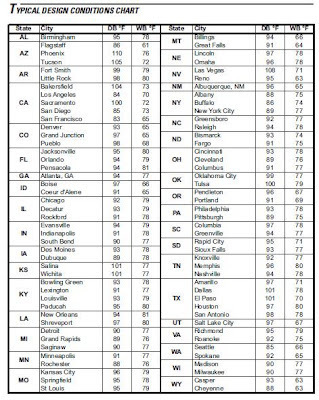 This chart should give you an idea of the potential air temperature that an evaporative cooling system can provide. The Green Grid whitepaper is just the latest in a growing number of research papers and documents that point operators and designers in a direction that can save tens of thousands of dollars and kwh if they are willing to make the investment in the latest technologies from both the IT equipment manufacturers and the HVAC equipment manufacturers.